d i v e r s i t y w o m a n . c o m Fa l l 2 0 1 8 D I V E R S I T Y W O M A N 47 By Victor ia Lim O n her way to St. omas in the US Virgin Islands a couple of years ago, Valerie Ramsey's jour- ney included a stopover in Puerto Rico. Using the free WiFi, she logged on to Facebook at the San Juan airport before the second leg of her trip. By the time she landed in St. omas, her sister-in-law had messaged her, asking why Ramsey would try to "friend request" her when they were already friends. In just a little over a half hour, someone had "spoofed" (duplicated) Ramsey's ac- count using her photos and information, and had "friend requested" everyone she was already connected to on her real account. "I think it happened because I used an open WiFi," she says. "I felt uneasy know- ing a stranger could see my friends and family." ISTOCKPHOTO Identity Hack DW Life > Money Matters is wasn't Ramsey's first problem with Facebook, nor was it her first account. She created the one that was duplicated after an incident in the early 2000s when she initially joined the social media plat- form. A coworker "direct messaged" her a link to a video. Or so she thought. "He wrote, 'Look at this video!' in a private message, and it was sent to a group of us," she remembers. "I clicked on it, and no video played. en I started having problems with my com- puter." A virus spread and "killed" her laptop. She was never able to recover her files or, most importantly, photos from years before. Sadly, as most of us well know, this still happens. Both of Ramsey's privacy violations are among the most popular ways cybercriminals steal your identity, according to the Identity eft Resource Center. By creating a copy of Ramsey's page, they could have linked her to a fraudulent site asking for her credentials, such as an email address and password, to capture her personal information. e fake video link was also a way to siphon personal information from her computer and automatically send the same link to her friends hoping they'd also click on the fake video. More than two-thirds of Americans use social media, according to the Pew Research Center. Facebook is the second most popu- lar platform, behind YouTube, followed by Instagram, Snapchat, LinkedIn, and Twitter. But less than 10 percent of us- ers believe social media platforms protect their data—and with good reason. In the past two years, almost every platform It is not antisocial to limit who can access your social media account. 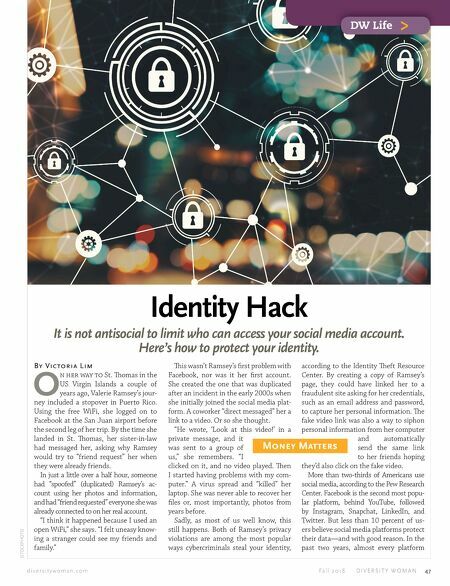 Here's how to protect your identity.